to normal the next day. He suffers from stomach migraines. They are hereditary in my family. usually grow out of it. so I knew what it was when they started. I'm still excited about opening my pattern shop. My Ravelry has all of my patterns in it. 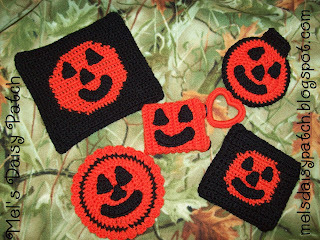 Facebook also has pictures of all the patterns I offer. too much at the moment. I've got some more patterns coming so keep a watch out. I'm in the process of designing a washcloth. I want to make the set. I think I might start on the towel holder first. The pattern is from my good friend at Mel's Daisy Patch. I can't wait to decorate my kitchen with them. This is the 3rd book in the series. Everything is getting more exciting. I'm wondering where the story is going? I'm so glad! Thank you for coming back and linking up! wow, you have a lot of projects started! good luck finishing them all - I could never keep up with soooo many things at the same time! 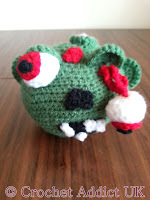 :D I've seen your zombie ball on ravelry last night- what a fun idea! I hope Little Red is feeling ok now. The zombie ball looks scaring. He is a lot better thanks. Linked up today! Thanks for hosting!! :D Have a happy day!!! Thanks for linking up. You are more than welcome. Hope you have a good day! Ya, gotta love this time of year...we get a spooky too. Hi Susan! 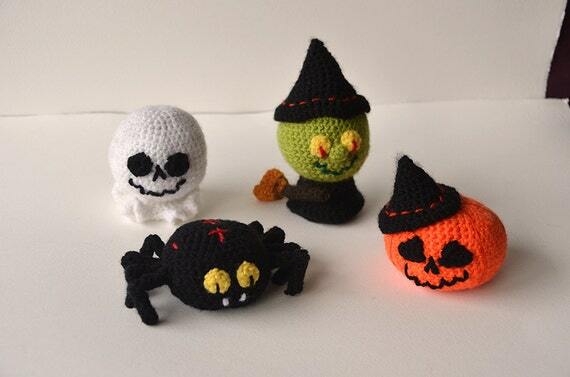 I love your creations for Halloween, the one I like the most is the witch, is really too cute!!!! Thanks. The Witch is cute isn't she.